In an industry as large and competitive as real estate, being aware of trends and observing changes in customer behaviour is vital to stay informed. Taking advantage of the statistical data and adapting your business strategy accordingly puts you a step above the competition. “Land was the raw material of the agricultural age. Iron was the raw material of the industrial age. Luckily for us, PwC and the Urban Land Institute have assembled a massive collection of facts, trends, and statistics in their 2018 report. It reflects the views of 818 industry experts, including investors, fund managers, developers, property companies, lenders, brokers, advisers, and consultants. 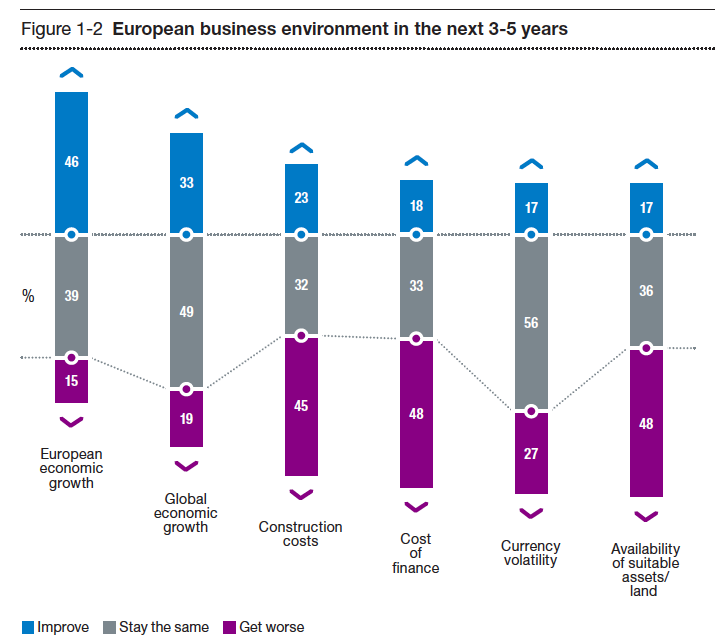 The respondents of the survey had some concerns about several aspects of the European real estate business. The main areas they expected to worsen over the next 3–5 years were construction costs, financing costs and the availability of suitable assets or land. The European real estate market is expected to undergo an increase in interest rates in coming years. While most of the respondents surveyed by PwC noted that rates would only somewhat increase, as many as 8% believed that long-term interest rates are going to increase significantly. 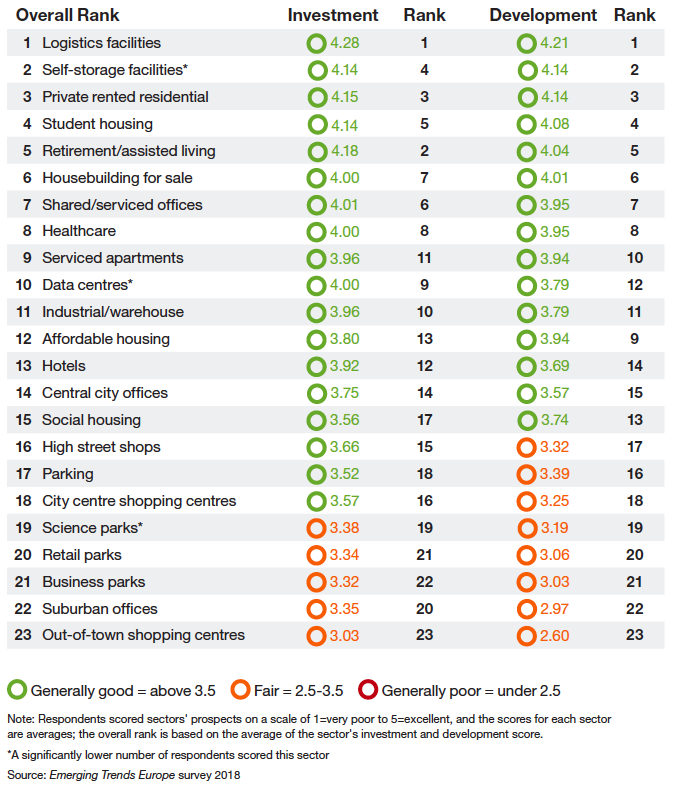 According to the PwC survey respondents, both property values and investment rates in the UK will fall. 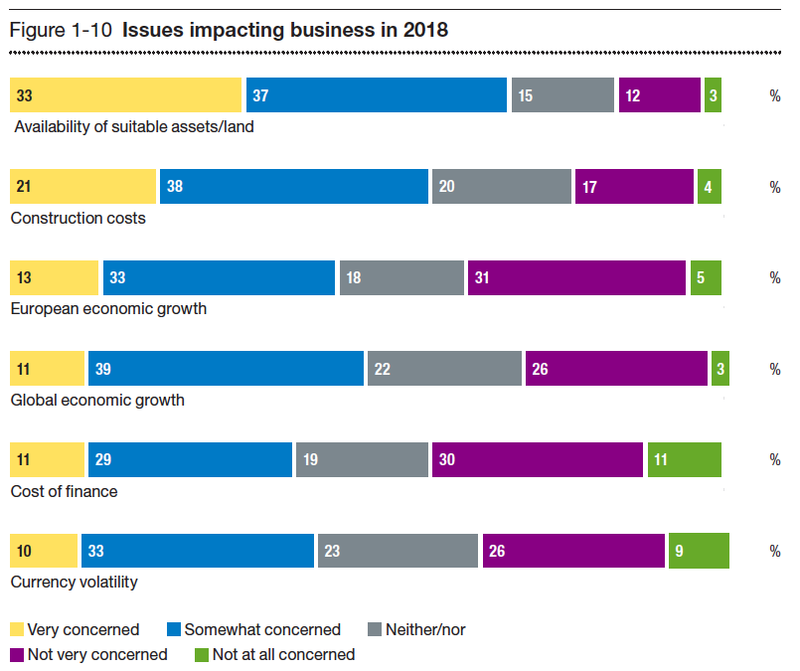 What is worrying is that 12% of them believe that real estate values will decrease significantly and a staggering 20% think that real estate investment will reduce substantially as well. What is more, 20% of respondents believed that the UK’s ability to attract international talent is going to decrease substantially. 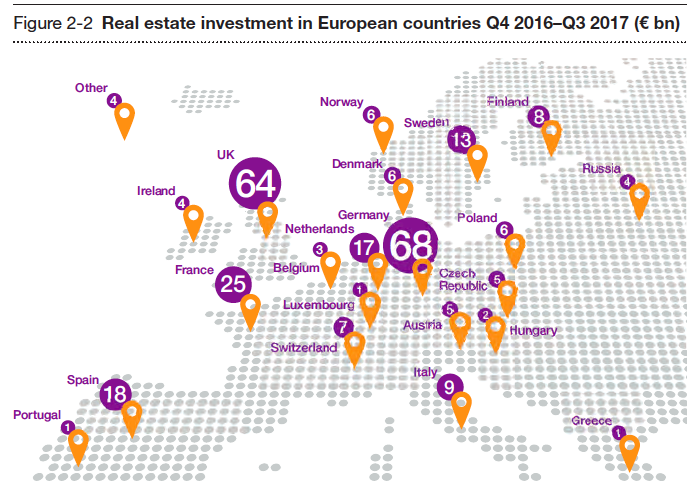 With point #3 in mind, the countries with the most significant real estate investments in Europe remain unchanged. Germany, the UK, and France lead the pack, with 68, 64 and 25 billion euros worth of investment respectively. Germany is at the top of the charts again, with Berlin being the most desirable city for investment, followed closely by Copenhagen, Frankfurt, Munich, and Madrid in 5th. In fact, German cities occupy four out of the top 10 on the list. Impressively, 36% of respondents strongly agree that enhanced data collection, analytics, and digitalisation improves real estate investment decision-making. 19% also strongly agreed that traditional real estate sector distinctions would become less relevant, as occupiers seek an “outcomes” based approach to their property needs. Collectively, 87% of respondents agree or strongly agree that institutional investors need to develop new and diverse skill sets in the new world of “space as a service”. And it is not just skills that are needed, but a rethink of what real estate is and how it delivers value. Understanding these concepts and adapting them with their skill set will give investors a competitive edge in the industry. According to the study, 2018 is a cautious, yet opportunistic year for the real estate sector. While the availability of suitable assets, construction costs, and rising interest rates remain a problem, logistics and self-storage facilities look to be the most promising areas of real estate investment. Brexit is already affecting the market and will continue to do so over the next few years. That being said, the UK is still comfortably in second place regarding real estate investment, surpassed only by Germany. 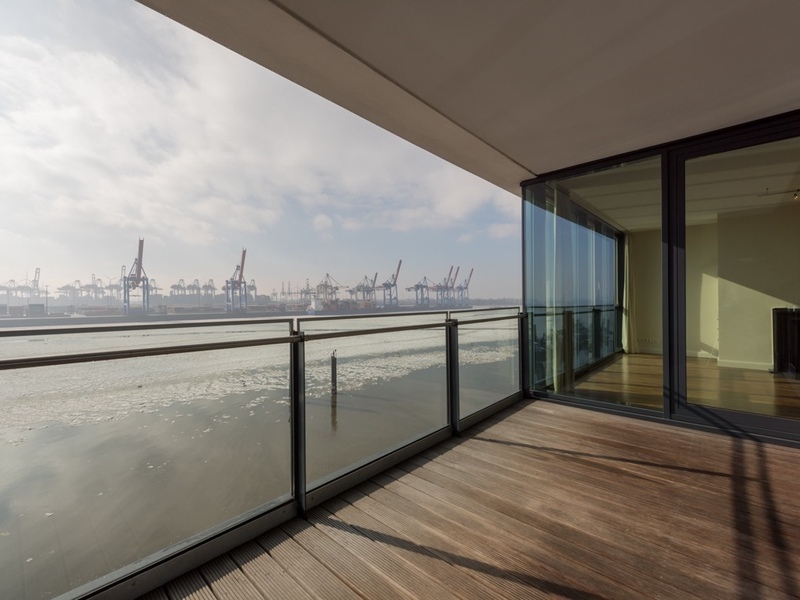 Berlin remains the most desirable city for real estate investment in Europe, with 4 out of the top 10 towns in the list coming from Germany. Finally, a large number of the survey respondents agreed that more advanced data collection and analytics would improve decision making in real estate. Overall, the ability to take advantage of digitalisation is going to benefit real estate investors, but it will require them to develop new and diverse skill sets.